The deportation to South Africa of a 92-year-old woman, who is cared for by her daughter in Dorset, has been temporarily halted. Myrtle Cothill was booked on a flight for Tuesday after having her bid to stay in Britain turned down. More than 75,000 people have signed an online petition calling for Mrs Cothill to be allowed to stay in the UK. Her daughter and lawyer have now said the Home Office has halted moves while awaiting new medical reports. However, no permanent decision has been made on her case. Mrs Cothill - a widow who arrived in the UK on a visitor's visa two years ago - has heart problems, is losing her eyesight and cannot walk unaided. Her daughter Mary Wills and son-in-law David, who live in Poole, are unable to move to South Africa because they have no right to live there. 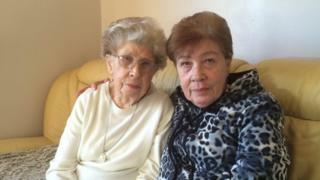 Mrs Wills, 66, says she fears her mother's move back to South Africa could be fatal. She said she was "delighted" that her mother had been granted more time. She added: "It has been a long, hard road and it has been very tearful. My mother is overwhelmed. "My mother is looking much better now, her mouth was quivering but now she is looking more relaxed. "We have had a huge amount of support, it has been brilliant. "Our fingers are crossed that the Home Office will see the light and let her stay for good." James Davies, senior asylum and immigration advisor for the International Care Network, who has been advising Mrs Cothill, said there had been "immense public support". He added: "It's very heartening the public interest, and people are very upset about it. "Rules need to have to be exercised with some discretion at the edges." A Home Office spokesman said all applications were considered on their individual merits and in line with the immigration rules. The decision to deport her had been upheld by two separate tribunals, he added.